I am incapable of shutting my mouth and smiling kindly when backed into a corner. It is a glaring flaw in my personality. Just today I was telling my mom about a conversation where my inner common sense was screaming at me to just listen to someone I completely disagreed with and let it go. Just listen and let it go. Nope. I firmly ignored that poised inner beauty and let the sweaty, striped capri pant, crazy haired girl with red armpits from laser treatment carry on like a Halloween lunatic. I’ve been this way since childhood. This unfortunate characteristic was the reason for the entire Santa Claus unmasking. The well mannered, quiet girl would have gotten a couple more years of childhood, but the loud mouth had to be protected by her mother. Here is what happened. Third grade started off with getting an out-of-the-blue giant nosebleed on my new dress, on the first day of school and my teacher would not let me walk the one block home to change my dress. This was a sign, in hindsight. Near Christmas vacation, we were in class doing a Christmas craft. The girl next to me said Santa Claus was not real. I told her if she believed that then he would not come and bring her presents. She said that she knew he was not real. This started a full blown discussion/argument including everyone around our desks and I was the ONLY one on my side. (Ok, Kristen Amy, WHERE WERE YOU, best friend??) I went home and indignantly replayed it all for my mother. A couple of hours later, she took me across the street to our church, early before choir practice. We sat in the sanctuary and she told me that Santa was really named Leanne and Dennis–but really just Leanne because I know my dad wasn’t picking out the presents. I sobbed. I was devastated. I asked if this meant that the tooth fairy also was not real. So many dreams were shattered that night. IF Santa is not a sure thing for your stocking, may I suggest some must haves to make the holiday stocking commercial, merry and feminine. Cleansing Balm, or aka miracle balm. $80 and lasts about 6 months. The price is steep, but lasts forever and is worth every cent. Cleanse your face with it, remove make up, slather it all over after a day in the sun or a day in a blizzard, rub it over bitten cuticles or tiny cuts. It is the most incredible soothing product I have ever used. The incredible scent comes from essential citrus oils. Beautycounter Body Butter, $39. Winter dries out your skin. You need that extra layer of thickness to protect yourself. My fingers crack, even in 65 degree weather. This is amazing. Again, the scent is from essential citrus oil. You are paying for the extra time in sourcing the ingredients and time spent ensuring its quality and safety. Support safer products. My lion cub has very sensitive skin and this soothes his baby eczema. Everyone Soap and Lotion, $11ish. I found these at Whole Foods, although available on Amazon.com as well. This is a non GMO and essential oil scented line. This is a HUGE bang for your buck and it’s fantastic. I bubble up the boys’ bath to the tippy top and then turn around and use it neck to toe on myself. This is my new fav for the bathing process. Living Proof Dry Volume Blast, $29 sephora.com. I just received an unfortunate haircut that I am referring to as the reverse mullet. I have more styling options with this as my #1 favorite hair product. Spray it after drying your hair, all over, mess it up and finish styling. It is equally as awesome as their dry shampoo. Don’t judge the product by my hair, just trust me. Ditch the conventional stocking and fill up some pretty cowboy boots with goodies instead. This is the most versatile shoe ever. I’ve been wearing boots for 20 plus years. I’ve given up my highest heels after having 2 teenies, but boots make me feel pretty and I can chase my cubs at the park in them. If you’re new, don’t go conservative. Jump in. Wear color. Cute dress with boots? Why not. Skinny jeans tucked in? Absolutely. Feeling fat? Boyfriend jeans, cuffed with a hint of boot peeking out. Perfection. No one looks at thighs when you have a detailed boot. http://www.countryoutfitter.com has my favs. Check out the Corral brand. Yes. Please. Athleta Chauranga capri, $64. It may be the first stripe to make thighs appear thinner and your booty perkier. I swear on all that is sacred that this is the BEST capri ever made. Put an IOU in the stocking with this picture because they’re back ordered until January, but get them. GET THEM!! Amazing. Plus, you can size down. Vanity sizing works for me. They come in a full length tight as well, but the fabrication is not the same. The magic is in the capri. Lou and Grey Steeeetch top, $59.50. Lou and Grey has wearable pajama fabrics. It’s the equivalent of a security blanket that has been washed 1000 times. Their fabrics are to die for. The fit is beautiful and skirts the timeless and trendy category in just the right way. I like this top because you can go full on athleisure with it. Pretend you are going to the gym when you pair this with your chaturanga capri. Check out the thumb tab on the sleeve. You look like you are pulled together with fitness goals. Win. Thegrommet.com. This site is my current obsession. They launch new products regularly and it is all based upon individual creativity. I. LOVE. IT. MADLY. You also get a video of the product. Check out the chicken launcher game. I was crying with laughter. BUT, to continue with the feminine stocking stuffer, I really eye balled the Impwear laminated cotton bags starting at $24.95. Laminated cotton. This not only appeals to the mother in me, but the clean freak. It is a giant pain to clean makeup bags, but I gag when bags get too dirty. This is a wipe down bag WITH a loop to hook upon things. You have several options in color combos too. Perfection. JBL Flip 3 Wireless speaker, $79.99 (currently at Target.com). I’m not tech savvy. I know Beats and Bose have these too, but the JBL had the best price and I love it. I hook up my Pandora app from my phone and have been rocking out to Christmas carols (Hello Trans Siberian and Manheim Steamroller) since November 1. I love that there are color options too. Perfect for a techie wannabe. Oil Diffuser. I’m not into candles. I don’t like the dust that accumulates on top and I’m over plug ins now that I have discovered the beauty of essential oils. I am a sucker. Plus, I feel fancy blending the scents. I am a scent junkie and this hits the spot. Plus, if you blend Eastern and Western medicine, there is science to essential oils and healing properties. In full disclosure, I rubbed fennel oil all over myself in an attempt to nurse the tiniest tiny longer and it didn’t work. However, I diffuse the left over fennel oil and it works instantly to make me smile with its scent. Amazon has a million oil diffusers to choose from.Youngliving.com has the best oils, but man are they expensive! Their Thieves oil is both therapeutic (hello cold and flu season) and it’s the best smell ever. It comes in cleaning products as well as the oil. It is the icing on the essential oil cake. It is, however, about $41. Here are a couple from Amazon that I have loved blending and are in the $7-$12 range. Clove and sweet orange are lovely together and perfect for a cozy winter afternoon. They are not just for the ladies either. My husband asked for a diffuser and starter set for his office. Boom. LaMarca Prosecco sparkling wine. My dad decided he had enough ties and shirts and decided to switch to buying fancy wine. He built a wine rack and started buying wine from The Wall Street Journal recommendations. He has a dot system for coding how fancy the fancy wine is. His children are not allowed to choose bottles with dots on them, certainly not a 3 dot bottle. In fact, after I stayed in my parents’ home for 5 weeks and they were concerned we would never leave, he implemented a top shelf only rule for me. I am only allowed to help myself to top shelf wine. He brought this one home for me one night. It’s very moderately priced and has a great sparkling taste that is not too sweet. Thank you Dad. Cards Against Humanity Game. This is not a new game, but so funny and wrong. It’s wrong that one might put it in a stocking, which makes it so right. You learn about people and how to play to your judge. For example, I learned my mother generally played the dirtiest card but would never vote for a dirty card when she judged. I love you Mom. I am not earthy. I am not new age. I am not bohemian, and I am not easy going. I am type A. I am all or nothing. This is great for an employer, but not always so great for home life. Aside from my car keys, I always know where things are and where they belong. I like things to be where they belong. 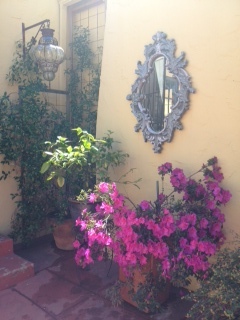 A source of great peace for me from my type A self is my courtyard. Before we had our house, we would jump in the car and drive around neighborhoods, looking for “For Sale” signs and praying the house would be semi-affordable. 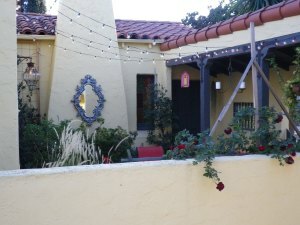 When we drove by our house and I saw the courtyard, I immediately put it in the unaffordable category. My first thought was to mentally inventory my closet and see if I could sell off my shoes and bags to make money. Not enough… My hair is terrible, so no one was going to want to buy that. I decided to look at the flyer for the price and cry. I was pleasantly surprised. In California, all homes are ridiculously overpriced, but this was a price we could swing! We got the house and started working. I ripped out cabinets and learned that electricity didn’t come from magic boxes in the wall. Every day, we ate lunch in the courtyard and I could envision things of beauty growing there and cool evenings with wine and friends. The house is finished and even with all the beauty in each new room, the courtyard is still the place that I find magical. Patrick has strung white lights across the top of it and it is my wonderland at night! I’ve introduced T to it too, and I am sure in the near future he will choose to play out there over his room. Each plant that lives there is hand chosen. The jasmine winds up the side of the door because it is the smell that I associate with California. It took years to get it going, and had to be moved around to find its proper home, but it has taken off! The gardenia was chosen because when its delicate flowers open, it is the smell of heaven. The azalea made it because of the hot pink color. It had a rough winter and is looking a little ragged these days, but Patrick has been tending it back to health. I battled the Aphids last year on my rose bush, and this type A girl won after much work and googling. 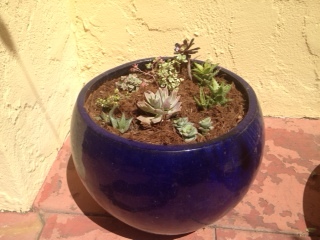 I added a succulent pot this weekend and frequently go outside in the beautiful spring afternoon to just look at it. I dangled Spanish moss over the courtyard windows. A dear friend gave us some and it reminds me of him each day. These plants don’t really go together or create one cohesive look, but each one relaxes me and lets me be earthy for just a bit. I grew up in Omaha, NE and attended college at Texas Christian University. I thought I was street smart when I moved to NYC because I was an adult. In Omaha, the streets were so tough that my biggest feud was with the rival high school’s show choir that won contests playing the fiddle to “The Devil Went Down to Georgia”. We had one guy in our grade who was Creepy McHandy, but all the girls knew to never share a table in class with him, and that was that. When I was at TCU, someone tried to break into our house and my response was to play dead. This was my background that prepared me for NYC. My parents were a wreck. I worked at a racketball/personal training gym when I moved to Manhattan because I could do laundry there for free. One of the personal trainers asked me if he could show me around the city. I accepted. My roommate asked me if it was a date. I said no. We worked together (I had watched a lot of Melrose), he was 40, and I was 22. Clearly he would not ask someone that much younger out. She asked me if he knew it was a not a date. It went without saying right? Nope. My first clue should have been when he became annoyed when some guy talked to me while I waited in line for the bathroom. Over dinner, he told me about his rescue cat. I love all animals, particularly ones that have come from hard times. He asked me if I wanted to go see his cat. Smarty pants said yes. We walked into his apartment and he immediately put the moves on me. I pushed him off and asked where the cat was. He showed me and I started to pet it. (Seriously says older me???) He then tried again. I told him we worked together and this was not going to happen. I reference this story with humor because God’s hand was on me that night in that it was only an awkward, and not dangerous, situation. We did not socialize after that night and I had learned a big lesson. I often think about situations I have put myself in when animals were involved. I don’t regret them. Today, two of my greatest joys in life are my rescue dogs. My big guy, Cooper, and I have a soul connection. I have never felt safer in my house, or out walking alone since Cooper joined our family. Rescue dogs have an innate appreciation for life, and I believe they are more affectionate because of their past. Cooper had some aggression when we got him. He tried to bite me when he thought I was taking a treat away on our way home with him. He also stalked all visitors who came over. We got a trainer, were consistent with him, and today he is the best dog who trusts humans. He guarded baby T from danger when we brought him home, and goes from room to room with me all day. He is a gentle giant who would have become a raging giant had he been with me the night I “went to see a cat”. There are so many wonderful animals in rescue groups or humane societies waiting for you to bring them home. Every day my day is better because of sweet Cooper and wild Ernie Bob. If you cannot adopt, support or volunteer, if you are able. Katie: Pat, why don’t we have a ceiling today? Katie: What if it rains? Pat: It never rains here. Katie: But what if it does? Katie: You know our neighbor’s cat pees on everything. If we don’t cover the hole to the crawl space, he’s going to come in here. Pat: He’s not going to come in here. Welcome to the crack den. Pat does not find this term amusing. He also didn’t find it amusing when I told him I was sure I would find used needles in the backyard. In his defense, I am extremely dramatic. I did think of placing one of my ivf needles out there as a joke, but didn’t think it would go over very well. Pat and I gutted and remodeled 90% of our house when we moved in. By ‘we’ I mean that I fully participated, in the heat, for 3 months and then complained and cleaned. It was brutal. One of the ways I kept myself from going completely savage while cleaning dishes in the bathroom sink was to have fresh flowers anywhere in the crack den. Sumatra and Stargazer lilies are my favorite. They are stunning and have a most glorious smell that can hide many chemical smells. When people came over, I could at least show them that while we lived like squatters, I had not forgotten my manners. I think outside of their visual fabulousness, I gained this love from my mother whose house is always filled with flowers. Her tip is to buy a bouquet and put 1 or 2 flowers in beautiful, tiny vases along window shelves. It looks so pretty and stretches the bouquet. P.S. Pat is a very accomplished architect. For more of his work, see his website at www.studiobuildca.com. He would love to help you with your den too! The bathroom now only washes humans and canines. No dishes.